No Fenders -Formula 1, IndyCar and A Whole lot more..: Schumacher returning! Holy Blogosphere Batman! Talk about your riveting news cycle, eh? As ironically, Seven times World Champion Michael Schumacher’s decision to return to the cockpit after an enforced three year sabbatical comes on the heels of his manager Willi Weber 200% categorically denying that his charge, Herr Schumacher… Or as David Hobbs enjoys putting it, Ralph Schumacher’s brother would NOT be returning to race in Formula 1 anytime soon, just 24hrs prior. “Schuey,” who hasn’t driven competitively since 2006, nor having driven this year’s recalcitrant Ferrari F60 chassis, will most likely be given special compensation to test prior to racing in Spain, which should help the promoter’s immeasurably, if the Renault penalty stands. "The most important thing first: thank God, all news concerning Felipe is positive. I wish him all the best again. I was meeting this afternoon with Stefano Domenicali and Luca di Montezemolo, and together we decided that I will prepare myself to take the place of Felipe. Though it is true that the chapter of Formula 1 has been completely closed for me for a long time, it is also true that for loyalty reasons to the team I cannot ignore that unfortunate situation. But as the competitor I am, I also very much look forward to facing this challenge." While the sitch is major suckage, Felipe is on the mend and will be rarin' to go next season. As for Ralf's brother taking the wheel in Phil's stead, I say ABOUT DAMNED TIME. I wanna see Miguel on slicks with minimal aero, pounding thru the field. Methinks he'll bring his old ruthless self back to the pointy end of the grid, and all the racing world will be better for it, at least for a while. 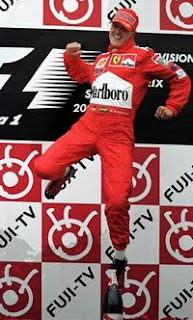 VIVA SCHUMI! On another note, kudos to your blog... I really enjoy your ramblings on all things mospo. Keep up the great work!